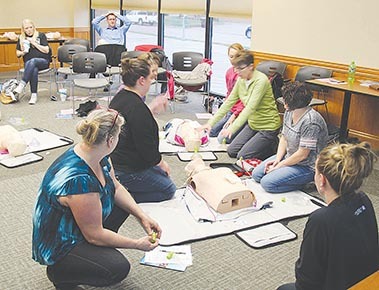 About 40 area residents were trained in cardiopulmonary resuscitation (CPR) by nurses from Boone County Health Center in the Kvam room last Monday and Tuesday evenings, April 23-24. Above, instructor Amy Zaruba uses one of the training manikins to illustrate the proper technique for giving chest compressions. In addition to CPR training, participants learned how to use automatic external defibrillators (AEDs) in cases of cardiac arrest. Others helping with the training were Angie Schalk and Marcia Seier. The classes were sponsored by the Albion Chamber of Commerce. Several people who were unable to attend the spring training session are signed up to take CPR training, to be offered again in September.